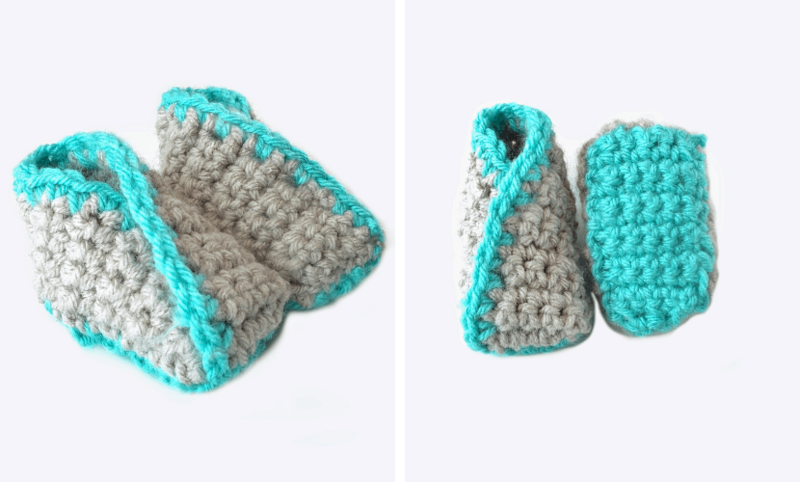 Baby booties make the easiest and quickest gifts because of their size, but there is also so much that you can do with them. 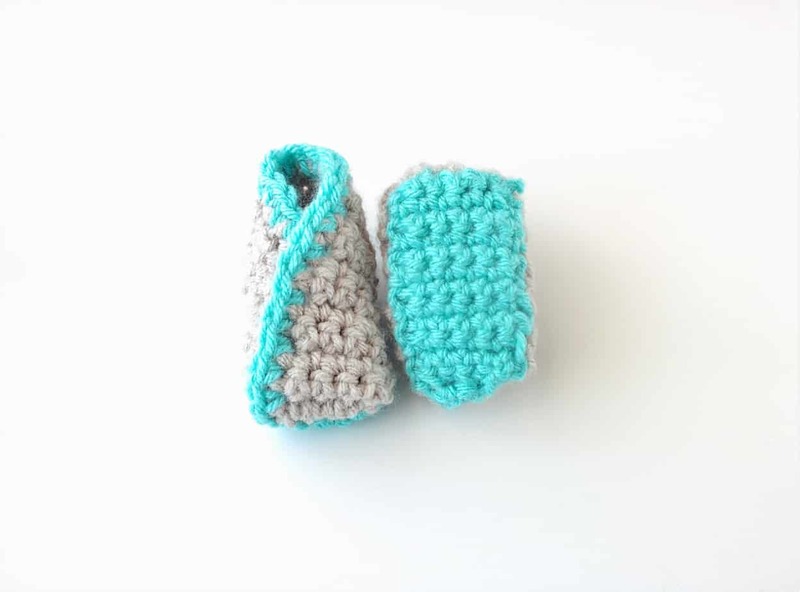 As long as you have a good base, it’s super simple to add onto a baby booties pattern and make it suit your style. One f my favorite designs for beginners is to work with a folding base that you can adjust easily to fit any size. 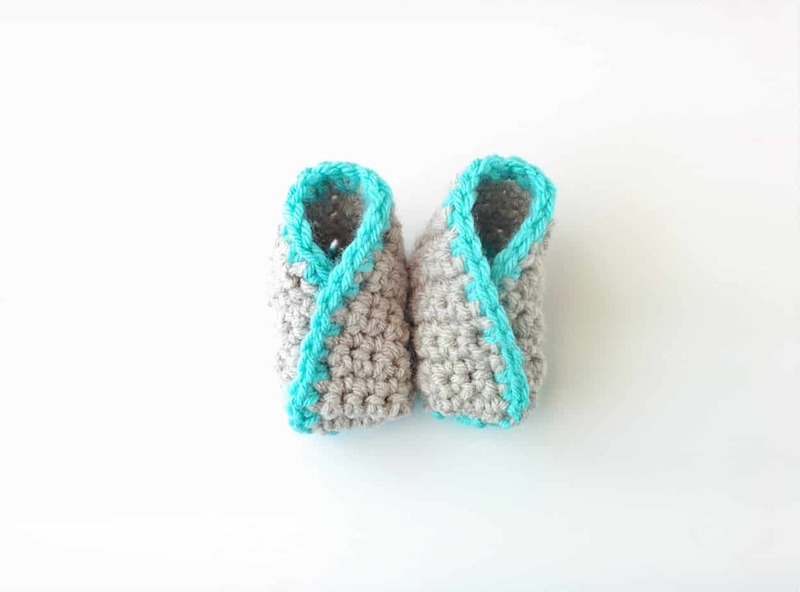 These are my crochet Kimono Baby Booties and today I’ll show you how to create this size and adjust it to a larger one too! 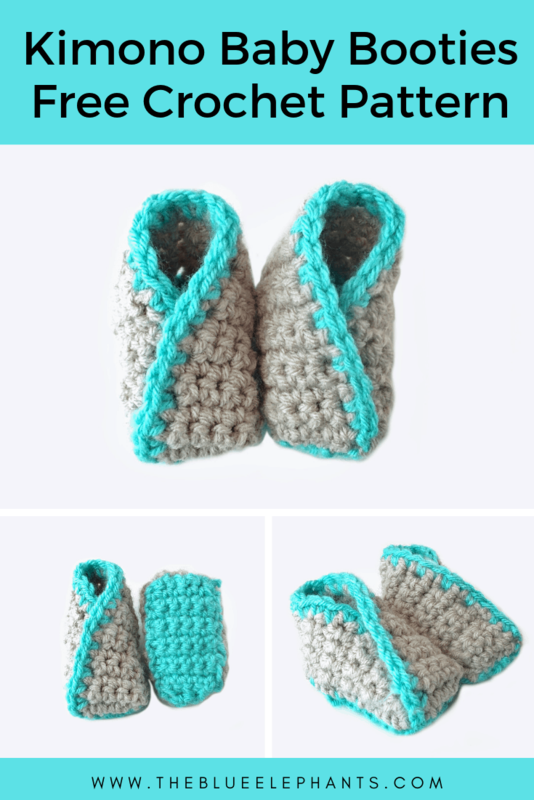 These baby booties were originally from my free ebook The Beginner’s Guide to Crochet, along with 11 other patterns designed for beginners. 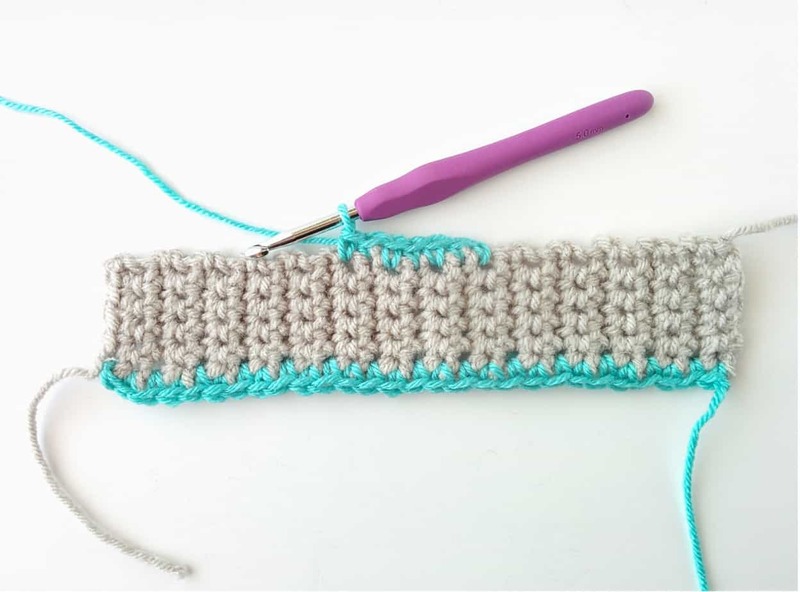 In this ebook, I share 12 basic crochet tutorials starting with how to create a slip knot and foundation chain to how to change colors and seam pieces together. 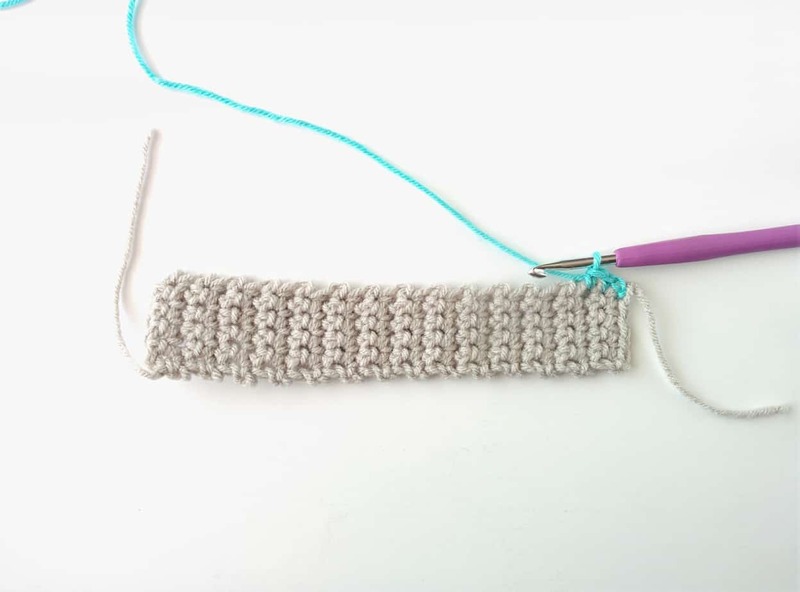 I also go over some tips to help you get started with crochet and a list of my favorite resources. 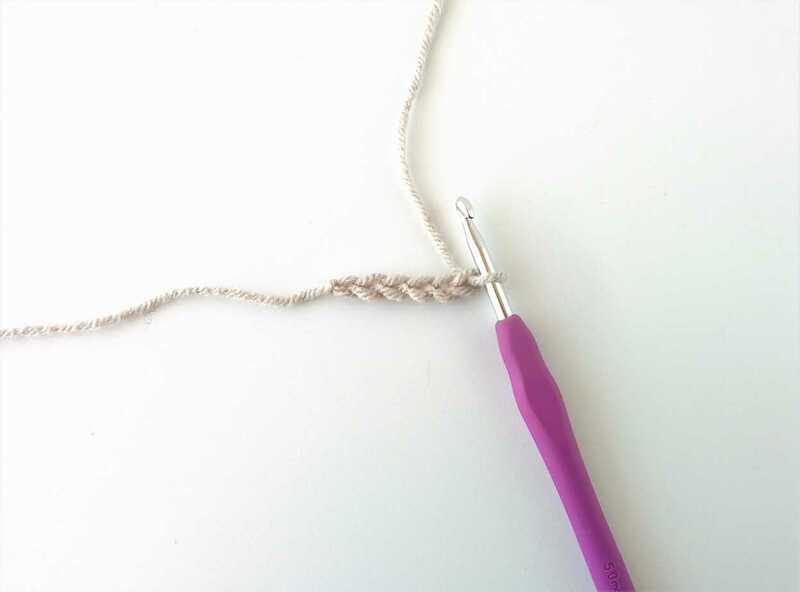 Plus, there are 12 easy patterns with written and video instructions! If you haven’t already grabbed the book, you can click the image below to get your copy for free! These baby booties are based off a knitting pattern I did several years ago. 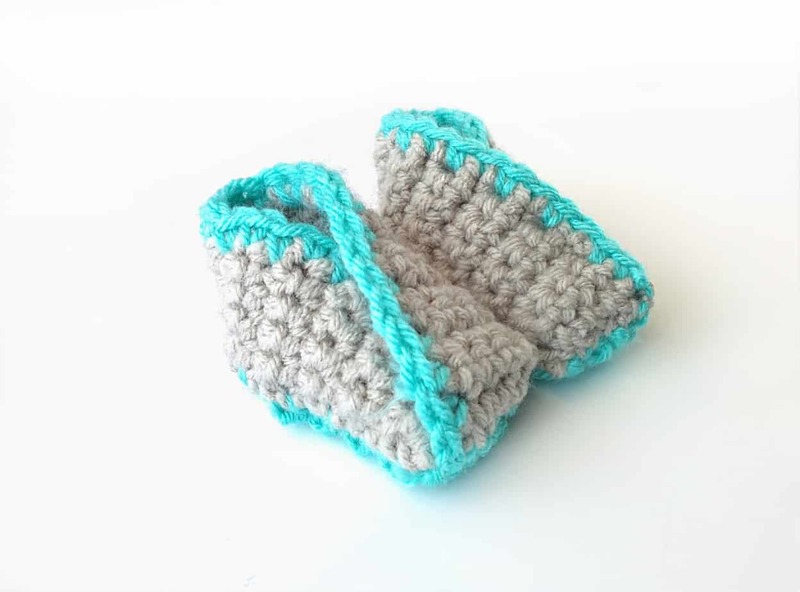 The pattern basically consists of two rectangles sewn together to make the shape of the booties. I used a contrast color to make the soles of these booties pop and matched that color to the border. 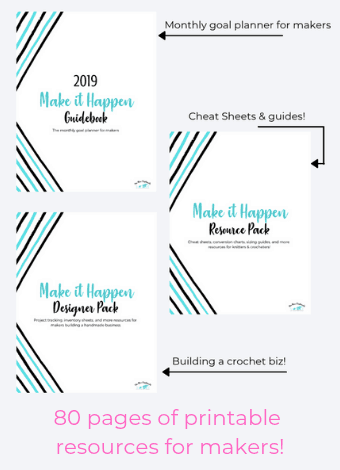 I only included one size in the ebook, but I’ve since then worked up more sizes and included them here and in the PDF. You can use any colors you like, but if you want something a little more girly, you can also check out my other baby booties patterns at the end of this post. 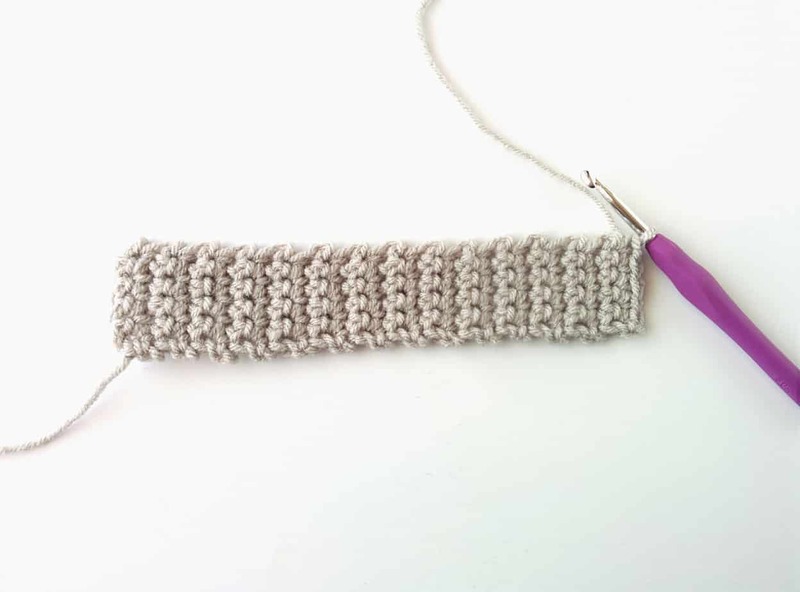 Row 1: With your main color (gray), create a slip knot and chain 6 (6, 7, 7). Row 2: Turn, and starting in the 2nd chain space, SC 5 (5, 6, 6). At the end of the row, ch 1 and turn. Row 3: SC in each space, chain 1, and turn. Rows 4-30 (31, 32, 33): Repeat row 3 for 27 (28, 29, 30) more rows. Bind off and trim the yarn. 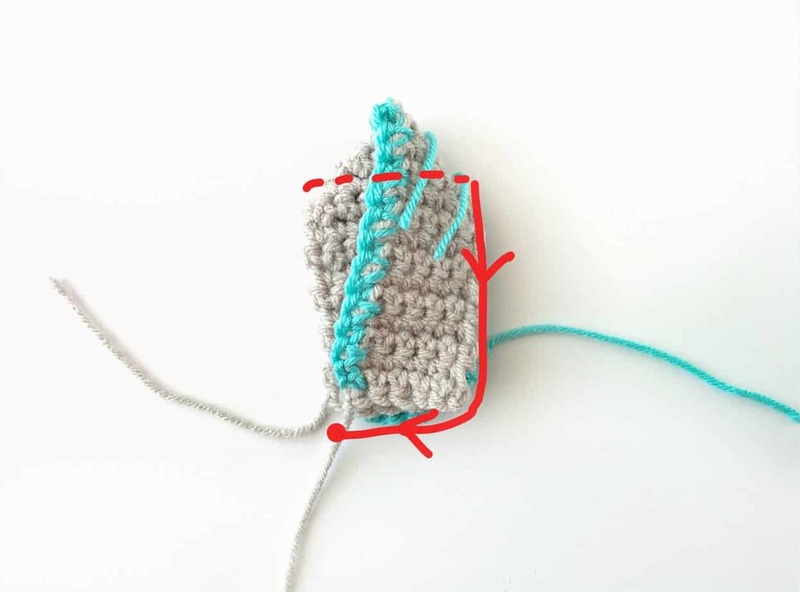 Attach a new piece of the contrast color (teal) to the last space you worked and, working into the spaces between rows, SC one row along the long edge. Bind off. 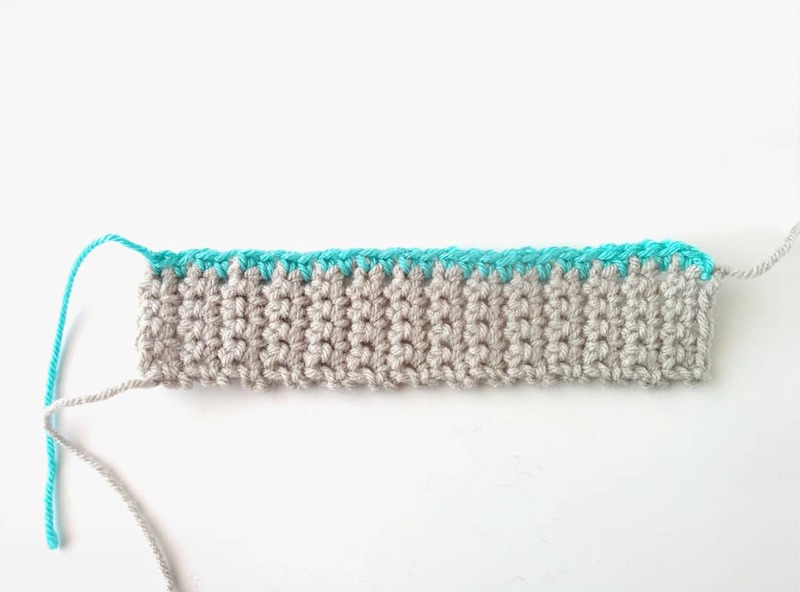 With the contrast color, attach a new piece of yarn row 11 (12, 13, 14) of the top piece, this time working into the gray side. Row 1: SC 7 (7, 8, 8) into the spaces between the rows. Chain 1, and turn. Rows 2-12 (13, 14, 15): SC along, chain 1 and turn. Repeat this for 11 (12, 13, 14) rows. These next two rows will shape the toe. Row 13 (14, 15, 16): Decrease once across the first two spaces, SC to the last two, then decrease across the last two. You should now have 5 (5, 6, 6) stitches. Chain 1, and turn. Row 14 (15, 16, 17): Decrease, SC to last two, decrease again. You should have 3 (3, 4, 4) stitches. Bind off and leave long tail to sew it all together. To assemble the baby booties, fold one edge of the top piece over to the toe. Use the long tail or new yarn (gray) and a tapestry needle to sew the short edge to the toe, then work along the side to sew that down as well. Follow the lines in the first image. Now, insert your needle through the stitches of the heel, and bring the yarn to the other side (the dashed line). Fold down the other side of the top over the toe and sew along the side to secure it. Be sure not to get the first side caught in your stitching! Then cross one side over the other for the toe and sew that in place. You can have both booties going the same way, or you can reverse them. BO and weave in any loose ends. Turn the bootie inside out to reveal the cleaner side and you’re done! 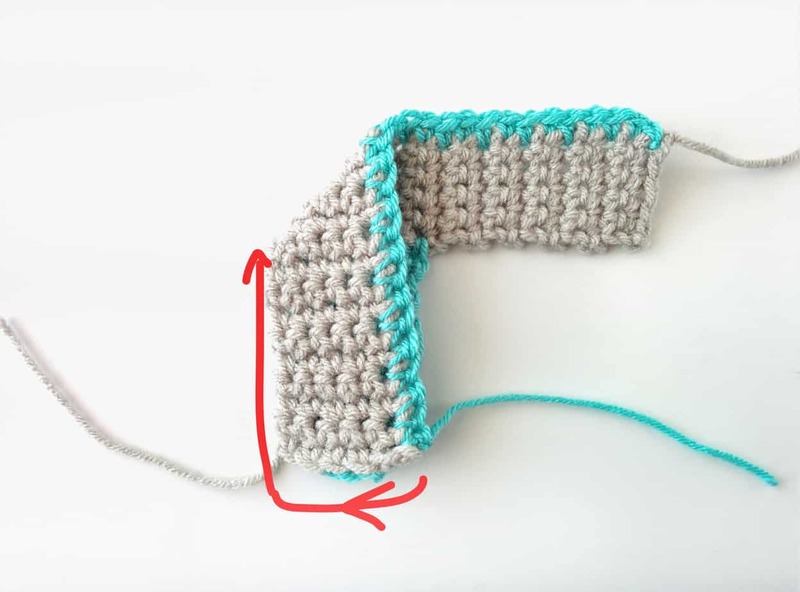 This pattern is super simple and if you want to watch me make it, don’t forget to check out the video at the top of the pattern! I loved making these and I kept them pretty simple. 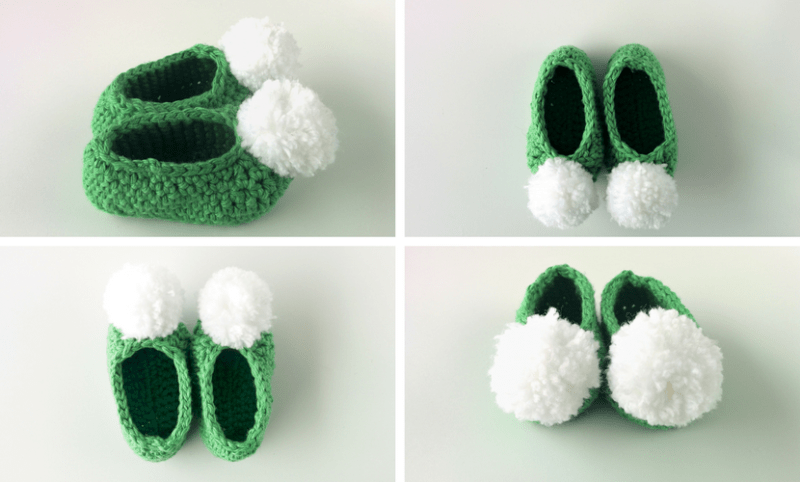 You can get creative with these baby booties. Add some bows or buttons to dress them up, use fun colors of yarn, or you can even work the top a little wider for a rolled cuff like in the knitted version. Thanks so much for reading. I hope you enjoyed this pattern. If you did, please share it to Pinterest and Facebook, it helps a ton! You can also use the box below to subscribe to the blog and get new posts sent right to you in the weekly newsletter. 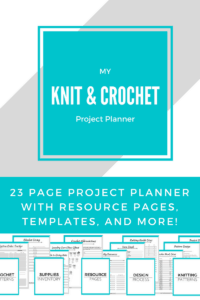 It’s totally free and you’ll get access to a bunch of knitting and crochet freebies in the resource library, exclusive tips and yarn deals, and so much more. Just fill out the box below and you’re set!